The last ride is a journey home! 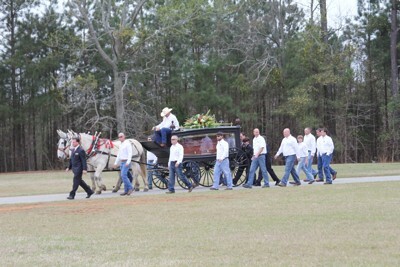 This hearse was from the 1800's and a pair of white mules pulled it home. Years ago, this would have a everyday ride, but not today. Wonderful way to honor and respect the passing of a friend. Oh! My husband would love this!! As sad as the occasion is, I think it is wonderful that they honored this person in the way they would have loved. Thanks for sharing. I've never seen anything like it. A scene like this convinced me to move to Ohio. 'Twas a funeral cortege for a marine killed in Iraq. Hearse was a horse-drawn antique. Surrounding area in Hudson, OH, was so wonderfully green, along with the trees. I was raised in northern MN so was used to greenery. But I was living in southern CA at the time, next county south of LA. It's all desert down there, with rat-ridden palm trees and thorns on all plants. No thank you. I wouldn't want my worst enemy to live down there. Although this photo depicted a somber occasion, it makes us older folks realize how it was for our grandparents and great grandparents. Thanks for a lovely photo to bring long ago memories back to us!